Today, it’s all about me! There’s a new article up at Skiffy.ca. This time it’s a review of the really tremendously good Torchwood: Children of Earth miniseries. My latest column is up at The MicroSoft website. My most recent radio interviews are now archived on the reviews page (finally updated after 5 years of idleness). And if you’re in Toronto this coming Friday, July 24th, come on down to Ryerson University where I will be judging the first ever SpeakOut Slam Poetry contest! I’m sure it will be a lot of fun, so don’t sit at home watching TV, come out and jeer –I mean support– your local slam poets. How can we top that? Well, how about news from The Other Ray that someone is claiming to have been impregnated from …wait for it… sperm from a swimming pool. Yeah. 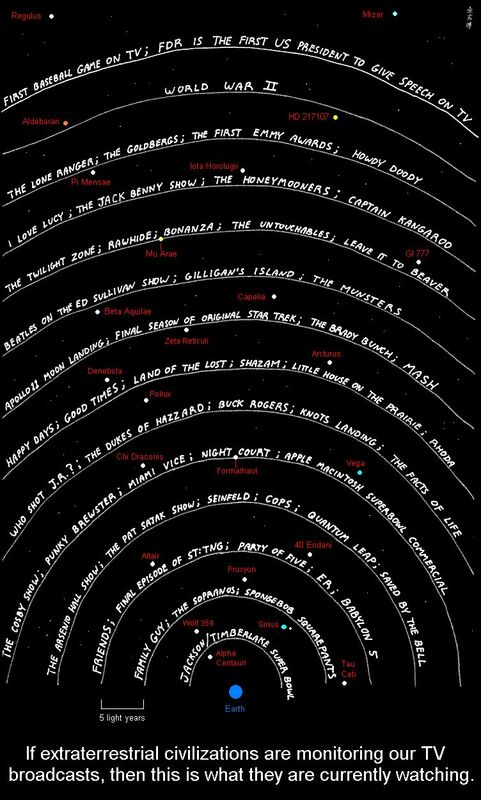 Ray also sends us the following chart showing just which human broadcasts aliens are presently listening to. We’re all screwed; you know that, right?